Donate by August 20 and Receive Your Copy, Too! Earlier this week we announced the upcoming release of World Trade Center Physics. It’s our latest major publication, and it’ll be sent to a staggering 35,000 engineers this coming September! This isn’t just any mail piece. 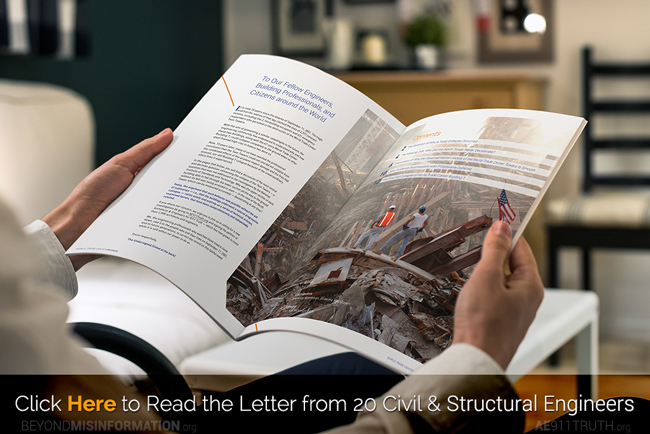 It starts off by commemorating the 15th anniversary of 9/11 with a spirited letter from 20 of our most dedicated civil and structural engineers, urging their fellow engineering professionals to finally take a stand. You must read it! 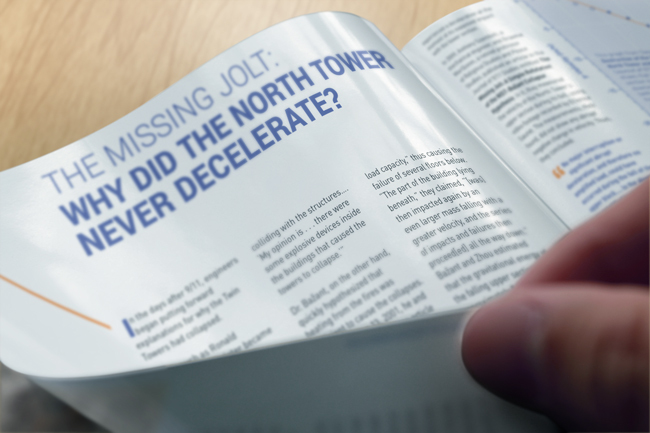 This succinct, 13-page publication provides decisive proof of what so many people — both engineers and laypersons — understand intuitively: The tops of the Twin Towers could not and did not crush through the floors below them. Only explosive controlled demolition can account for the destruction we witnessed that day. We illustrate this truth by showing NIST’s failure to provide an explanation of the Twin Towers’ total collapse and by debunking the articles of civil engineering professor Zdeněk Bažant, upon whose bogus analysis the official story depends solely and entirely. In telling this story, we expose the role of the ASCE’s Journal of Engineering Mechanics in suppressing criticism of Bažant’s work — and thus suppressing the truth about 9/11. 35,000 Dollars to Reach 35,000 Engineers! Indeed, this campaign will be phenomenally cost-effective. Every dollar we raise will allow us to reach one engineer. That includes the cost of printing, postage, and renting the mailing list we’ll be using. Here’s where you come in! 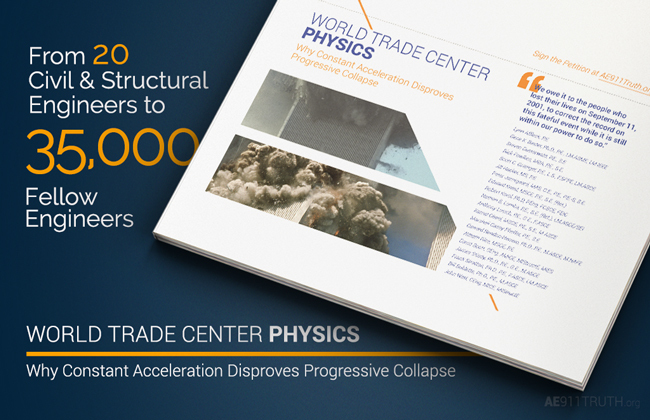 Donate $25 or more by August 20 (or $30 if you live outside the U.S.) and you will receive a souvenir copy of World Trade Center Physics in the mail — not to mention reaching one engineer with every dollar you donate. What better way could there be to enlighten 25 or more engineers on the 15th anniversary of 9/11? Thank you for helping us observe the 15th anniversary in a truly meaningful away: by galvanizing the engineering profession to support a new investigation of the World Trade Center’s destruction.